SPARTA, Ky. (Sunday, Aug. 17, 2003) - It was no contest for Sam Hornish Jr., who led 181 of the 200 laps en route to his first victory of the 2003 season in the Belterra Casino Indy 300 at Kentucky Speedway. 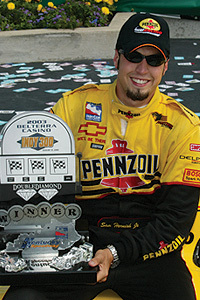 Hornish, driving the No.4 Pennzoil Panther Chevrolet, established a new average race-speed record of 197.897 mph. The previous mark of 180.917 mph was set by Alex Barron in July 2003 at Michigan International Speedway. "We know we need to have a good-handling race car above all else, and we have to be able to pass," Hornish said. "The car was fairly easy to drive. I was trying to keep as much of a lead as I could. I know that sometimes you can become complacent, and your head isn't where it should be, and some strange things happen. We were just trying to stay focused all day. "We are focused on what it is going to take to win this championship. I'm sure there will be a lot of people that have a problem with it, but we have worked so hard this year. I feel bad that they feel that way, but I don't feel bad about winning." This is Hornish's first victory since he won at Chicagoland Speedway in 2002. The victory is also the first for a Chevrolet engine in 2003. "We won five races last year," said Hornish. "It's not like this is the first time we've ever won. We are not some no-names who got a new engine and went out there and won." At one point, Hornish and second-place finisher Scott Dixon, driving the No. 9 Target Chip Ganassi Racing Toyota, lapped the entire field. Third-place finisher Bryan Herta, driving the No. 27 Archipelago car, was able to get back on the lead lap when he beat Hornish out of pits during a yellow-flag pit stop. Hornish, Dixon and Herta were the only cars on the lead lap at the end of the race. "When Sam came around and they said he was coming up to lap me, I couldn't believe it," Herta said. "He came around me, and I was wide open in top gear. I thought we had the car pretty trimmed out because we thought we needed some speed. That's a little disheartening." Dixon was able to close the gap on Hornish in lapped traffic, but the IndyCar Series rookie was never a threat to taking the lead. "I'm not sure if we maybe had a little too much downforce on, but the car was very good in the traffic," Dixon said. "There's always going to be a compromise, and we got stuck there in a big group for a while, but I think that's pretty much all we had today. "It was a big day for us today, especially for points. Obviously, winning and 10 points extra would've been a lot nicer, but it was a good day. We did our best this weekend." Herta started in the 13th position and made the biggest jump, improving 10 positions to finish third. "I couldn't run with Scott (Dixon), and I couldn't run with Sam (Hornish Jr.)," Herta said. "They had a little more, but I'm real happy with the result we had. After the last stop, my car wasn't quite as good as it had been. I'm not sure why. But that last stop, my guys gave me an awesome stop, and they got me back out ahead of Sam, which put us back on the lead lap and in contention for the win. That was huge." The one caution period came on lap 147 when Kenny Brack's No. 15 car suffered an oil leak and caught fire. The sole caution period establishes a new IndyCar Series record for least number of cautions in one race. The previous record of two caution periods was set in 1997 at Walt Disney World. Other IndyCar Series records were set, including most consecutive green flag laps and most consecutive green flag laps to begin a race (146).